There is a common perception in the West that developing countries just don’t know how to farm and that WE either need to help them grow more food or send them some of the excess food that our system produces. Although there certainly is potential for increased agricultural productivity in developing countries, farmers in many of those countries actually produce quite a lot of food. Some of the thorniest problems arise post-harvest, and this post will look at a way of dealing with one of the biggest of those problems. insufficient infrastructure to transport crops to markets, etc.). 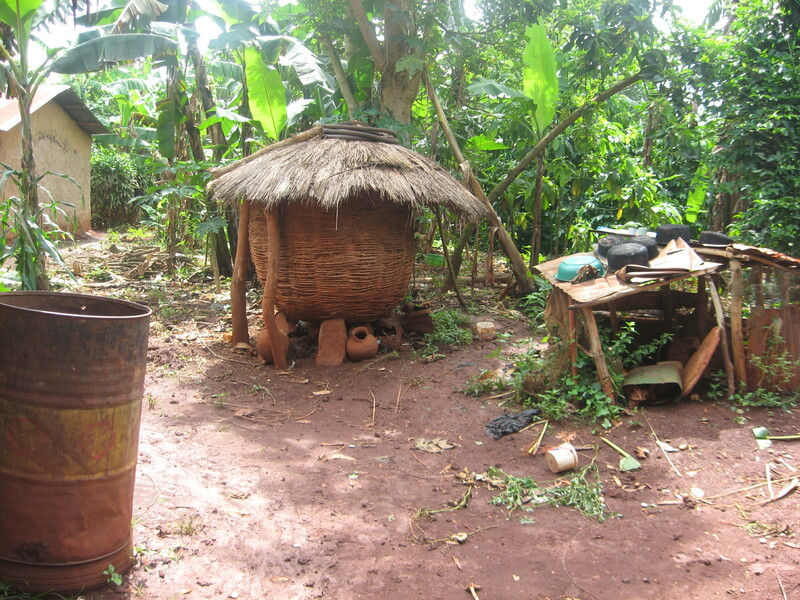 Having seen, however, the standard grain storage mechanisms for farmers in Uganda (at right), and knowing that even less secure methods are used it’s easy to see how rats, insects, and microorganisms (to say nothing of excess heat or moisture) can ruin a bountiful harvest. Better storage facilities are needed. Moreover, the inability to store crops for any significant length of time drives down the price that farmers can get. Roger Thurow and Scott Kilman in the book Enough (2009, PublicAffairs) document how the tragic Ethiopian famine of 2003 came just one year after farmers in Ethiopia had one one of their best harvests ever. But because all these farmers brought their crops to market at the same time, there was a glut which drove down prices and meant they weren’t able to recoup their costs. The lower income meant that they had less to spend on inputs for the next season’s harvest and decided to plant less, contributing to the next year’s famine. Being able to store crops in reserve allows farmers to respond to price signals and choose to bring their products to market when they can get a good price, rather than having to bring everything shortly after harvest. Scale is important. And modern storage facilities capable of keeping out pests and the elements could be expensive, especially for smallholder farmers. But I think the communal nature of many societies in the developing world makes it possible to envisage solutions that wouldn’t work in more individualistic societies. So, the big idea here is to have cooperatively owned and operated crop storage centres. It would take some financing for the initial building of the storage units (maybe through microloans, but probably a bigger credit facility), but hopefully the increased income for the farmers using the storage centres would help pay off the initial investment rather quickly. The most sustainable model would be for each member of the co-op to contribute dues in order to be able to store their crops. The fees would be used for maintenance and could also be used to expand and add storage capacity if the farmers start producing more. Of course this is a micro-level solution and there are still macro issues that must be addressed to insure farmers in the developing world can access markets. Creative business models aren’t a substitute for policy reforms, but they can complement, and perhaps even spur those necessary structural changes. In my opinion, “revolution” is one of the single most overused words in modern English. Nevertheless, if we were to grant, as some would have us, that a “food revolution” is underway in the US, it already has its thermidor. Apparently concern for one’s health has become so mainstream that gratuitous disregard for it has become hip and counter-cultural. Please note: I am not simply making the observation that many Americans have disgustingly unhealthy eating habits. Rather, I find that such diets have become almost chic. Last weekend, for example, I was with some friends at a pub (which shall remain nameless) whose menu included such delicacies as Spam Bites (deep-fried spam and cream cheese), Deep-Fried Pickles and Pie Bites (deep-fried bits of pie). Now mind you, this establishment is frequented by young, hipster types, not, as one might imagine, crotchety old men who don’t give a damn about all this healthy eating nonsense. The former are the ones who concern me. To some extent, I can see the logic behind this counter-revolution. Even hyper-conscious eaters have their guilty pleasures, so perhaps these Grease Monkeys just feel they’re being more honest and upfront about their proclivities. And perhaps this backlash is somewhat justified: although healthy eating is becoming more and more plausible as more and more places are beginning to sell real, fresh food, many of the most avid diet-pushers make eating healthy seem completely unenjoyable. Hell, even I’d choose a burger over flax seed roll-ups. But once again, what makes this attitude so troubling to me is that it is prevalent in a demographic that really should know better. The followers of this food counter-revolution are largely urban (i.e. they don’t live on a dairy farm, where butter is readily available and their economic livelihood), young (they grew up in an era when plenty was known about the health consequences of various diets) and middle class (they can afford reasonably healthy food). Now, I’m not suggesting that it’s acceptable that people in other situations (poor, rural, elderly, etc.) have unhealthy diets — it’s just that usually there are circumstances external to the person that dictate their food choices. In the demographic I am discussing, however there is usually the option to eat something healthy (or at least to not eat something so unhealthy), but they willfully decline. Put another way, these people are eating things that are ridiculously unhealthy, not because they have no other choice, but because to do so is cool. without the bacon? Some wag will invariably respond “Everything is better with bacon,” and that’s just my point. Bacon seems to be the icon of this counter-revolution. Its mere mention causes otherwise rational people to say odd and disturbing things. Once when I was at a chili cookoff, one of the cooks was sharing his recipe with a friend and me, and told us that he started by sauteeing onions with bacon. He then inserted a dramatic pause to allow us to goggle over the mention of bacon. When we failed to produce the desired response, he supplied it himself. Now, chili is a reasonable, if not entirely orthodox, place for bacon to be. But it should not be in chocolate, vodka or any of the other unseemly vessels we have allowed it to occupy. I’m fairly certain that if you found someone who partakes in one of these novelty items, injected them with truth serum, and asked them if they actually enjoy the taste, their honest answer would be ‘no’. But in just about any other setting, the desire to be cool mandates an answer in the affirmative.